Are you living on a limited fixed income or participating in a government program like Medicaid or Food Stamps. If that's your situation, you re eligible to receive a free smartphone with a free monthly phone plan. Or if you're searching for free cell phones for seniors, Lifeline Assistance Program is the solution, here you will find out everything about that government sponsored program, are you qualified for that program or not and if you are eligible how to participate and which companies provide the Lifeline Assistance Program service. Let’s first talk about the Lifeline Assistance program, this is a government sponsored program that aims to provide free cell phones for seniors and low income citizens, not only that, but if you participate in the program you will get a free cell phone plan of 250 minutes airtime per month and free text messages that differ from provider to another. More than 15 million Americans are enjoying the benefits of that service, but there still many other millions who are qualified to join the program, Are you one of them? 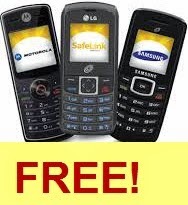 Are you eligible to get free cell phones for seniors? Another way, if you are a senior or a citizen who living on a limited income below 135% of the Federal Poverty Guidelines (FPG) and can show that you are qualified. The free cell phones and minutes are provided by a number of nationwide wireless companies such as Safelink Wireless and Assurance Wireless and ReachOut Wireless, and also there are regional wireless companies that provide that service too. Most of the states have more than one Lifeline service provider, the free cell phone options and plans may vary from one provider to another, that means you need to check each provider to get the best offer. Here are the nationwide wireless companies that cover most of the United States and provide free cell phones for seniors. Assurance Wireless is a big Lifeline provider company that provides free cell phones for seniors, Assurance Wireless is a subsidiary of Virgin Mobile which uses the Sprint network, it provides a free basic cell phone, free anywhere 250 minutes and unlimited text messages per month. Safelink Wireless is one of the biggest companies that provide free cell phones, it’s owned by Tracefone which uses the four major carriers, Safelink Wireless provides a free basic cell phone and free anywhere 250 voice minutes and 1000 texts per month. ReachOut Wireless is a Lifeline provider company that generated as a division of Nexus communications, it provides a simple senior friendly cell phone and free anywhere 250 minutes per month. That was the big three wireless companies that provide free smartphones for seniors and free cell phone plans for seniors too, you can check the regional providers in your state to the best service.